TORONTO, January 31, 2013 - Hudson’s Bay Company (hbc.com) today announced an exciting new Rewards Program that lets shoppers earn more points faster when shopping at Hudson’s Bay, thebay.com or Home Outfitters. Hudson’s Bay Rewards members will now earn one point for every dollar they spend on almost anything in store or thebay.com*, and move to ‘Rewards Plus’ and ‘VIP’ status as they achieve spend and visit levels. As shoppers move up the tier levels, they earn more points per spend. Point accumulation is doubled when using the Hudson’s Bay MasterCard® or Hudson’s Bay Credit Card along with the Hudson’s Bay Rewards Card at Hudson’s Bay, thebay.com and Home Outfitters. Rewards points are also earned outside of the Hudson’s Bay family of stores; members using their Hudson’s Bay MasterCard earn two points for every $1 spent everywhere else MasterCard is accepted, and receive a 25% bonus, semi-annually, on those points. Customers can now redeem for Hudson’s Bay gift cards instantly at the register at the Hudson’s Bay family of stores. HBC and Capital One Canada worked in partnership to redesign and better integrate the existing HBC Rewards and Credit programs. The teams coupled expertise in rewards and consumer insight along with retail acumen and best practices to create the new Hudson’s Bay Rewards Program. 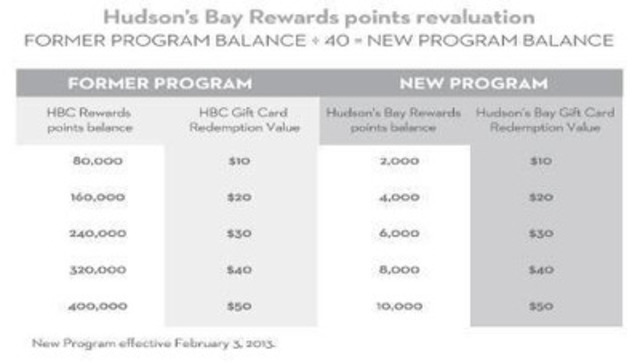 As of Feb. 3rd, HBC Rewards points will automatically be converted to Hudson’s Bay Rewards points. The new points balance is calculated by dividing the existing points total by 40. The monetary value of the points remains the same even though the points’ total changes. For example, 80,000 HBC Rewards becomes 2,000 Hudson’s Bay Rewards points, which can be redeemed for a $10 Hudson’s Bay Gift Card. Existing HBC Rewards points cards will remain valid for the accumulation and redemption of points. With offices in Toronto and Montreal, Capital One has offered Canadian consumers a range of competitive MasterCard credit cards since 1996, and now includes the Aspire suite of rewards cards which are regularly cited by leading rewards experts for the great value they offer consumers. Capital One Canada is a division of Capital One Bank, a subsidiary of Capital One Financial Corporation of McLean, Virginia (NYSE: COF).